Life span of flowers may vary according to their Type and Species. If you follow these guidelines, they should last between one and two weeks if they are cut flowers. +If your Flowers have arrived without WATER (Box of Roses, for example) the first thing to do is to water them as soon as possible in a Vase. Carefuly unpack your Flowers as soon as you receive them. If you leave them in a box or without water, they will perish soon. Use Clean Containers (Vases) to ensure an uncontaminated habitat for your flowers. IMPORTANT: The water level in the vase should be as tall as half the size of the stems you have received. For example, if the Stem is 23 inches long, the water level should at least reach 11,8 inches. 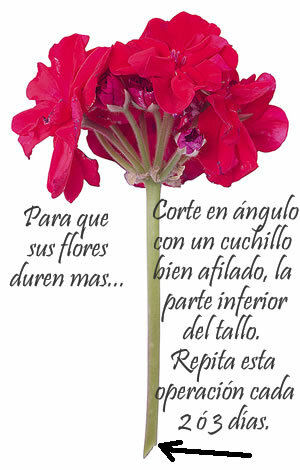 If your vase is too short, you may carefully cut the stem of your flowers. Remember that the stem length should not be greater than twice the size of your vase. For example, if your vase is 7,8 inches tall, the stem should not be longer than 15 inches long. Use fresh, pure water with your plants and flowers. If you use other nutrients or "vitamins", follow their instructions. If you add too many additional products to the water, this may result in a damaging environment for your flowers. Keep water levels above half the vase. Cut and remove leafs and other plants below water level. These may perish and create bacteria in your water-filled vase, damaging your flowers. Make a DIAGONAL CUT to your stems with a sharp knife or scissors. Do not tear the stem. A diagonal cut will ensure a larger area for water absorption. Put your flowers inside the water-filled vase . Keep your flowers in a fresh environment. We reccomend a temperature below 60°F (15°C). The lower the temperature, the longer they will take to bloom and they will last longer. Don't place flowers and fruits in the same place or vase. Fruits may shorten the life span of your flowers due to Ethylene. Keep your Flowers away from TV's, Microwaves, Fans or Computers. Any electrical device produces heat that may damage your Flowers. Change the water in your vase every 2 or three days. We suggest you clean your vase again and cut the stems once again (as explained in step 5) to ensure perfect water absorption. Watch the video below for additional information.. Maintenance Guide and Tips for Flower Arrangements with Oasis Floral Foam. Oasis Floral Foam is a solid product that is submerged in water to guarantee water absorption for your Flower Arrangement. Each stem is carefuly placed inside the Foam by our florists. 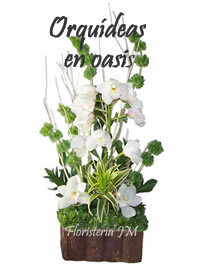 Carefuly water the Oasis Foam when you receive your Flower Arrangement. A small amount of water should suffice, as our Florists have already included water when arranging the flowers. Periodicallly, (every 2 or 3 days) check for humidity in the Oasis Foam and water accordingly. 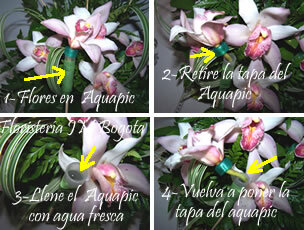 Maintenance Guide and Tips for Flowers with Aquapic Floral Water Tubes. Some Flower Arrangements are specially arranged with Floral Water Tubes to ensure a longer life span. The original stem of the flower is cut and placed inside these tubes, filled with water. These Floral Tubes MUST be kept with water at top level. Every 2 or 3 days, check the tubes, open them and fill them with water. Your Flower Arrangement will last longer if each tube is constantly refilled. Don't Forget Flowers are living species that constantly require water! Maintenance Guide and Tips for Bromeliad Plants. 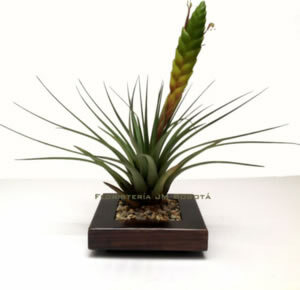 Bromeliad plants are decorative plants that require very minimal care. They purify the air in any space and are perfect gifts for people going through a tough recovery. According to the University of Kansas, plants help speed up recovery on patients. Water your Bromeliad at least once a week at its base and make sure its leafs are left dry after watering. Water on the leafs may rot the plant. Bromeliads need to be close to a source of light, but kept away from direct sunlight.